"Serial" provides a general interface for serial communication through RS-232 and RS-422 protocols. Serial communication is typically available through /dev/ttyXX devices on Unix-based systems or COM ports on Windows-based systems. Serial communication is often implemented in hardware using a UART. 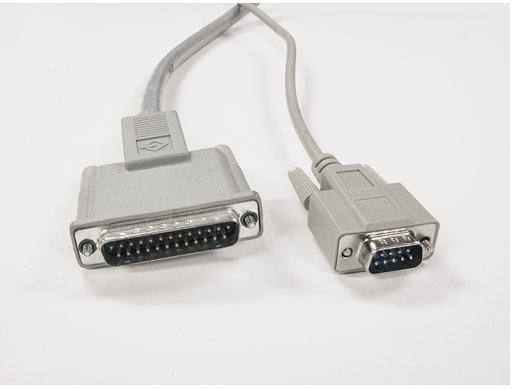 Physical connectors for serial ports include D-subminiature 25-pin connectors and DE-9 9-pin connectors. Serial communication is also often done through USB, Bluetooth, etc. Serial connections are not usually automatically discoverable and can often only be determined from documentation. On Unix-based systems, names of serial connections can sometimes be identified by comparing the list of /dev/ttyXX devices before and after a particular connection is plugged in. opens the default serial port. opens the serial port with the specified name. Typical names on Unix-based systems are "/dev/ttyXX" or "/dev/tty.usbserialXX" and under Windows are "COM1", "COM2", etc. opens a serial port with the specified options. Typical baud rate values include: 4800, 9600, 19200, 38400, 57600, 115200, 230400. "DataBits" gives the number of bits in each byte used to carry data. Possible values are: 5, 6, 7, 8, 9. Possible settings for the flow control handshake protocol "Handshake" are: None, "RTS", "XOnXOff". Possible values for "Parity", specifying how the parity bit should be set, are: None, "Even", "Odd", "Mark", "Space". "StopBits" gives the number of bits used to separate data frames. Possible values are: None, 1, 1.5, 2. Configuration is not required. Use DeviceOpen to set parameters for the serial connection. reads a single byte from the serial connection, returning an integer value. reads a single character from the serial connection, returning the character as a string. reads all available bytes in the serial connection buffer, returning a list of integers. reads the most recent n bytes in the serial connection buffer. reads bytes from the serial port buffer until a terminator term. Wolfram Language functions such as DeviceReadLatest and DeviceReadTimeSeries are also supported. Bytes are represented in the Wolfram Language by their integer values. Lists of bytes can be converted to character strings using FromCharacterCode. The setting for "ReadTerminator" can be a single byte or character. If no data is available to be read, the read functions will time out after a preset time of 10 seconds. writes a byte b to the serial connection. writes a list of bytes bi to the serial connection. writes the bytes in a string to the serial connection. Wolfram Language functions such as DeviceWriteBuffer are also supported. Bytes can be specified either as integers between 0 and 255 or as single-character ASCII strings. flushes any data that has been read and buffered. gives True if there is any buffered data available for reading, and False otherwise. The "SerialReadyQ" command can be used to check whether reading from the serial connection could block. closes the serial connection and frees related resources. These examples were run on a Raspberry Pi with an Arduino connected by USB. The Arduino is running a custom program called a sketch.